Comparisons between Bob's Burgers and The Simpsons are inevitable. Both are cartoon programs on Fox airing in the same animation block, and both involve a strange but lovable lower-middle class family struggling to live while having wacky adventures. I've certainly fallen into that trap myself, casually referencing The Simpsons' increasing quality as a parallel for Bob's Burgers' progression in its first few seasons. But tonight was different. The Simpsons didn't just feel like a convenient parallel. Instead, it felt like a deliberate inspiration. The opening scene sets that feeling. What we see is an ominous shot of an unmarked van, and a man's mouth chewing on a toothpick. A box slides out of the van, creating a glow in the bushes. This isn't conventional Bob's Burgers fare, which tends to be based on general sitcom conceits. This is a science fiction thriller's introduction, not a comedy's. It's a short scene, only 20 seconds long, so it hardly gets in the way of the coming comedy. But the willingness to play with genre, particularly for homage form, is one of the key elements of The Simpsons. There's more to it than that, though. The man's mouth with the toothpick puts the focus on his lower face, which is traditionally one of the areas where The Simpsons distorted its cartoon faces the most. When we see the rest of him, his curly hair and beady eyes also make him look very much like a one-off Simpsons character. I'm not sure I'd have picked up on this had the episode not focused so much on his mouth initially, but once I saw those animated aesthetics, and the genre nods, it was difficult not to see. Of course, what really makes the homage work isn't just that it's fitting and clever: it's that the episode is funny, regardless of how connected to E.T. it may be. The first joke—the store name “Earth, Wind & Tires” in during the intro song—is one of the funniest of those intro jokes. It's one of the corniest the show's done, but it's corny in an utterly absurd fashion. That's not just a bad pun for a store name, that's a store name that doesn't make any sense. Excellent. That's the style of humor that runs through the episode. The characters seem smart enough to get the concept of puns, but not necessarily smart enough to get those things right. Teddie believing that Bob's name is “Bob Burgers” works along these lines as well. This brand of comedy is appropriate given that it's a Gene episode (that's also light on the far-more-aware Louise). Gene is confidently earnest, and “O.T. the Outside Toilet” manages to focus on that aspect of his personality, which seems to work better as a Gene-focused episode than his occasionally manic energy has in previous attempts. The B-plot, involving Bob discovering that his life is better in a suit, is equally Simpsons-esque (remember when Homer was Max Power? Or Marge got the cut-rate Chanel suit?). It's also damn funny, particularly an all-too-real scene where Linda gets drunk at a fancy bar and starts substituting words. “You said 'snatchy'.” “Shut up! DRINK.” I liked that this was primarily a way to show the parents having some fun and getting some jokes in, while the climax bringing the entire family together to defend a talking toilet worked as well. Really, everything worked about “O.T. 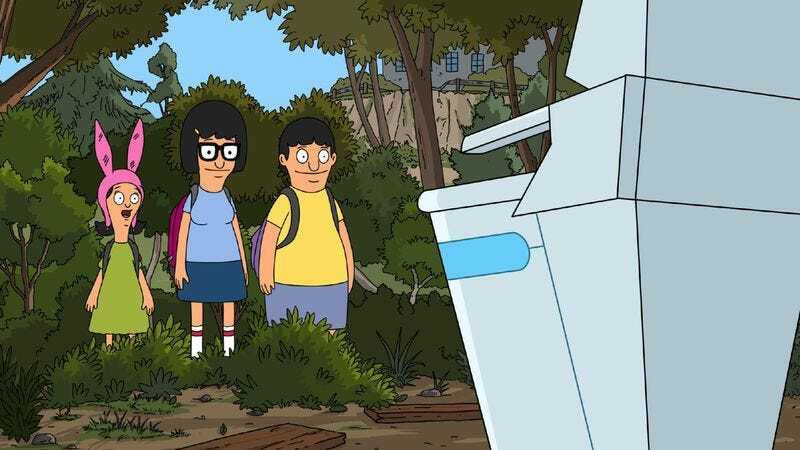 the Outside Toilet.” I'm not sure I want Bob's Burgers to always remind me so much of The Simpsons, but I could be persuaded if it was always this good. “And wipe that baby off your face!” The fake-baby-to-take-care is one of the cliché television plots I roll my eyes at in theory, but tend to enjoy in practice. Gene killing baby after baby was fantastic. “I haven't seen one! I…haven't even used one!” Gene's lies are totally believeable. “Playing artist: Wings.” Jon Hamm voiced the toilet, and was superb at it. I see more talking toilets in your illustrious future career, Mr. Hamm.